Freelance documentary photographer oriented toward investigation of social realities, communities and identity related issues. In the last years he has worked on migrants and asylum seekers issues in Europe and the Mediterrenean Sea. In 2006 he published the book “Hotel Industria” and the volume “Ex Fabrica – Identities and mutations on the border of the metropolis”; about former industrial areas on the north of Italy, inhabited and transformed in shelters by illegal immigrants. He has worked in the slums of Nairobi, Cairo and Port Au Prince; part of a long on-going project about metropolis and informal settlements communities. He has photographed in Haiti, Kenia, in the Sub-Sahara area of Western Africa, in Congo and Colombia, among other places. 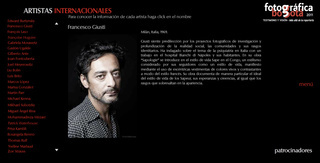 His project “Sapologie” won the 2nd Place Prize for Arts and Entertainment Stories at the 2009 World Press Photo Awards. He has recently worked in Egypt and Tunisia during the 2011 arab uprisings.